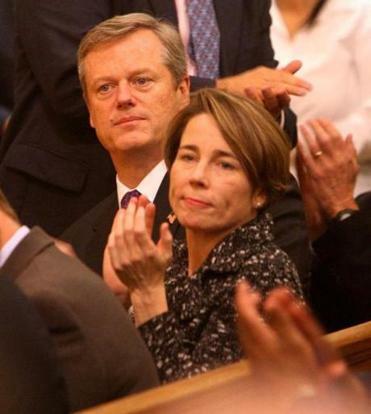 Governor Charlie Baker and Attorney General Maura Healey will be featured in a Massachusetts Taxpayers Foundation event Friday focusing on the opioid crisis. The toll that the opioid epidemic is taking on the Massachusetts economy now has a cost in dollars: $2.7 billion a year in lost business productivity from employees who aren’t functioning at full capacity, and $5.9 billion in lost productivity from people who aren’t even in the workforce. Then there are the costs to government: roughly $1.9 billion a year spread among various state agencies, and more than $500 million in public safety costs for cities and towns. These are just a few of the estimates in a new study from the Massachusetts Taxpayers Foundation that was funded by the new anti-addiction nonprofit, Rize Massachusetts. It marks the first accounting, according to its authors, of the economic toll of the opioid epidemic in Massachusetts. The taxpayers foundation is hosting an event Friday on the opioid crisis that will feature Governor Charlie Baker and Attorney General Maura Healey. The taxpayers foundation estimates that opioid addiction kept nearly 33,000 people from participating in the labor force each year, on average, over the past five years. And the annual costs to health care providers total nearly $1 billion, some of which is paid by the taxpayer-funded MassHealth and other insurance programs. The number of opioid-related deaths in Massachusetts dipped slightly last year, by about 4 percent, to roughly 2,100, from the all-time high seen in 2016. But that drop has been attributed to the more widespread availability of naloxone, a drug that can save people who have overdosed, and not a sign that addiction-related problems are abating in a significant way. The personal toll has been well documented, and the Legislature has already passed two laws in recent years aimed at curbing the epidemic and its impacts. But addiction is still stigmatized, and many employers aren’t aware about the extent of the economic damage. The main goal of the report, the foundation said, is to encourage more business leaders to help with the crisis. The creation last year of Rize Massachusetts is one of the clearest examples of how business leaders have already stepped up. The initial donors included General Electric, Partners HealthCare, Blue Cross Blue Shield of Massachusetts, and the 1199 SEIU health care union, which together contributed nearly $13 million. Rize wants to raise as much as $50 million over the next few years. Rize executive director Julie Burns hopes the report will end the myth that opioid addiction is only a big problem among the homeless, or people not looking for jobs. It also hits colleagues and employees in offices, factories, and schools. Some industries are getting hurt harder than others. Bert Durand, communications director for the New England Regional Council of Carpenters, said many carpenters work through pain so they can earn a living. That can make some more susceptible to the use of painkillers that can lead to addiction. As a result, the council launched a program two years ago that provides members with up to 90 days of addiction services in a recovery home.